You may recall that one of my favorite plants is Black-eyed Susan vine (thunbergia). After discovering it a few years ago, I look for it every spring. This year, I bought several to plant in different areas of our yard. One of my favorite places to plant it is on our deck, where the plant can grow up this old-looking weathered white trellis. This photo was taken on May 19. Apparently I’m not the only one who thinks this is a good location. 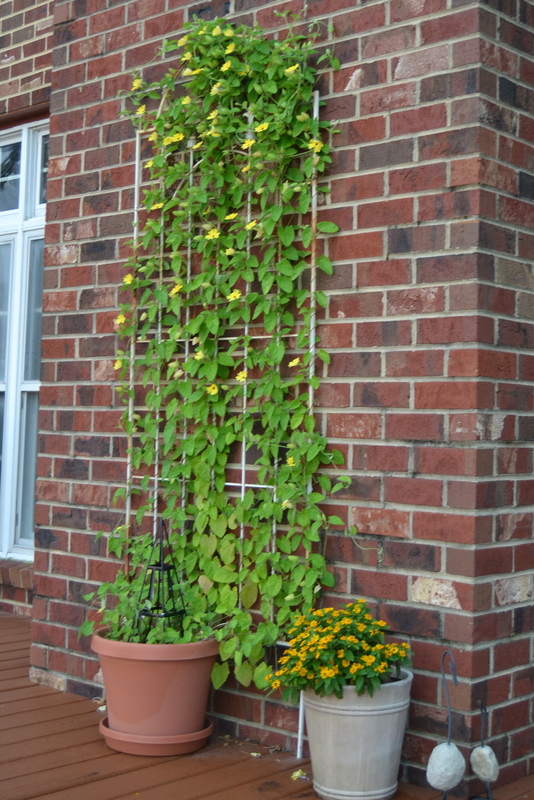 This entry was posted in Days at Home and tagged black-eyed susan vine, thunbergia. Bookmark the permalink. Beautiful! Obviously they are “happy campers” there on your deck! 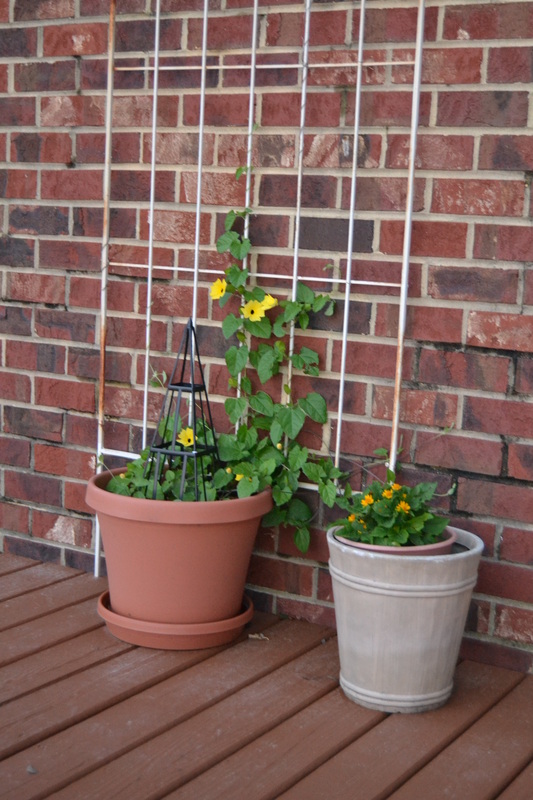 Nothing says summer like black-eyed susans on a trellis. Looks like the vine thinks it has a prime location…really has flourished! Just beautiful. But then you have the green thumb! That vine knows where to grow. I’ve had a time this summer cutting the kudzu and keeping it out of the azaleas. Lovely series of photos. 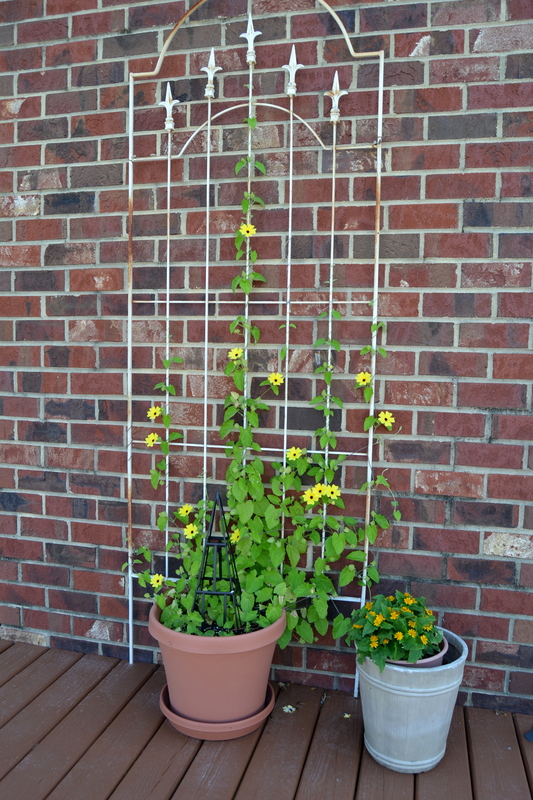 My black-eyed susan you gave me on gate is really blooming now. Next year I will definitely plant where can it can go as hight as it wants! The little vines just growing straight up from gate with no support, waving in the wind. I learn something new every day, as I never knew there was a BES Vine! WOW! Absolutely stunning! And yes, it loves this location! Yes, it is very happy there! Being a Susan…I love them too! It sure did grow! Oh they are just beautiful. And HAPPY!! Lookin’ very content back there! Wow! Now I will be looking for it every spring too. Beautiful! It did a fine job of covering the trellis. Beautiful addition to your garden. Beautiful! I really like the way you took several pictures across the span of several months.